This is the story of the lamb stew that wasn’t. It starts with losing two members of Dinner for the foreseeable future – one to an internship at L’Espalier, and the other to rehearsals for a play. On the one hand, those are obviously good things and we’re pleased for them. On the other hand, we won’t get to see them as much and that’s sad. And, on a third hand, they are coincidentally the two people at Dinner who don’t like lamb which means that while they’re off not coming to Dinner I can serve lamb to my heart’s content. With this in mind I took myself off to the grocery store two weekends ago to buy the fixings for lamb stew. In the back of my mind I more or less assumed that this would require, at some point, a trek down to Whole Foods for lamb and figs. But lo, there were figs at my local grocery store. And more mysteriously, there was a broad selection of cuts of lamb. If my life had a sound track this is the point when the ominous music of ‘don’t go down that staircase to the dark cellar’ would have started playing. However, as my life is sadly lacking in an omniscient soundtrack I went ahead and bought the lamb. When I opened the package of lamb I sniffed at it a little dubiously. But, it’s been a while since I’ve made lamb, and lamb does smell gamier than most other meats I cook. I checked the sell by date on the package, and I sniffed again and finally decided that it was fine. The problem is, once a seed of doubt about whether meat is still good has been planted, it’s hard to convince yourself that it is fine regardless of the actual quality of the meat. I kept going back and sniffing the meat, and sniffing my hands. And one time it would smell fine, and I’d be reassured, and the next time it would smell distinctly off and I’d be dubious all over again. Unfortunately I didn’t come to a definitive conclusion about the lamb until after I’d made the stew and tasted it. I finally decided that it just tasted odd and I was better off not risking it. Then I got sick – unrelated to the lamb stew that may or may not have been bad – and didn’t have Dinner last week anyway. I went into this past weekend cheerfully assured that I didn’t have to think about what I was going to make for Dinner this week because I already knew – lamb stew. Then Sunday morning I was flipping channels and caught about 90 seconds of “Throwdown with Bobby Flay” and saw someone making biscuits and realized with horror that it had been months* since I last made biscuits and immediately had to rearrange my Dinner menu to rectify this. * 4 months, I checked, and then I checked again because this seemed just so unlikely. I happened to have pomegranate seeds on hand this week because there were pomegranates at the grocery store last week and they’re fun to eat, if a little time consuming to break down. They were a really nice addition to the salad. They’ve got a great sweet-tart crunch and burst of flavor. I don’t know that I’d go out of my way to find them the next time I make chicken salad, but if I have them around I’ll definitely use them. Also, they’re terribly pretty on top of the salad. I am bound and determined to come to a greater love of beets. They’re just so pretty, and I want to like them and I figure if I make them often enough eventually I’ll just cave and start really enjoying them. Apparently my newspapers agree with me because in the last month the Boston Globe, the New York Times and the CS Monitor have all run articles on the best foods you’re not eating and featured beets. 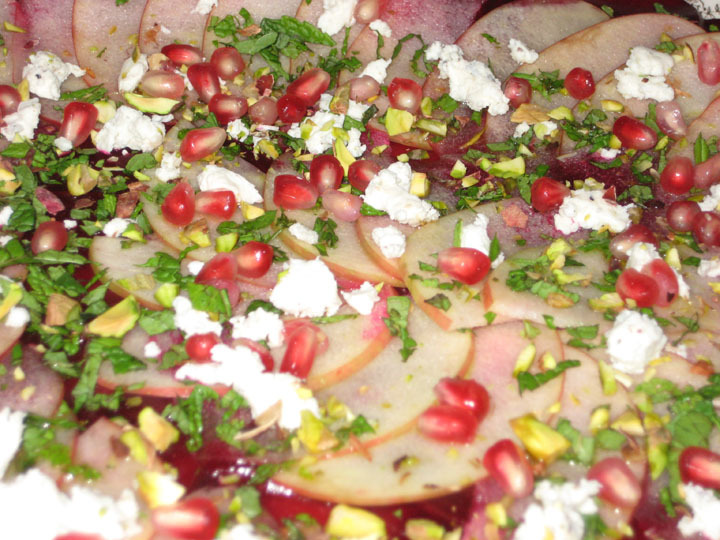 The Beet Carpaccio recipe from the Boston Globe certainly looked aesthetically pleasing in the picture, and it’s terribly seasonal with the beets and the apples. Plus, any excuse to use my mandoline. I substituted some local goat cheese for the feta because I happened to have some on hand that needed to be used, and can you really go wrong with goat cheese? 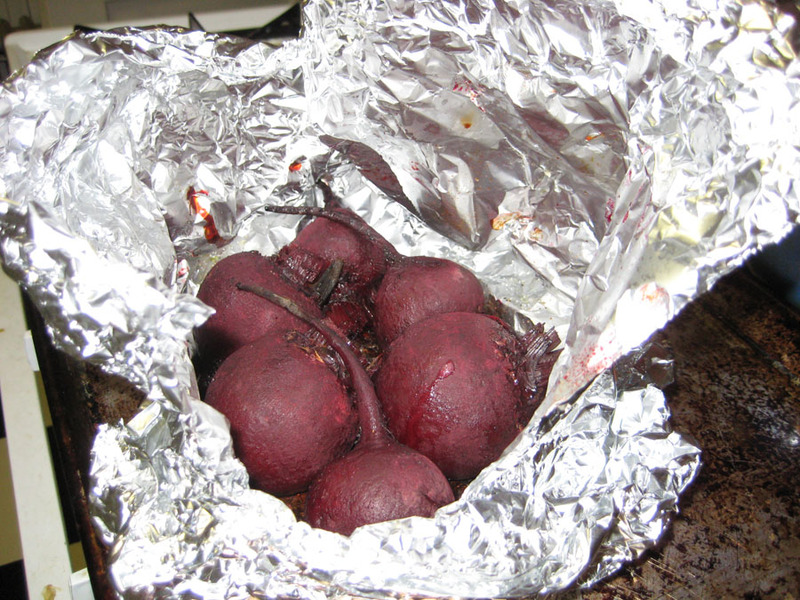 Toss the beets with the olive oil and salt, wrap in a foil packet and roast in a 375 oven for 45-50 minutes, or until tender. Allow them to cool slightly and then peel. Allow them to cool completely (or refrigerate over night). 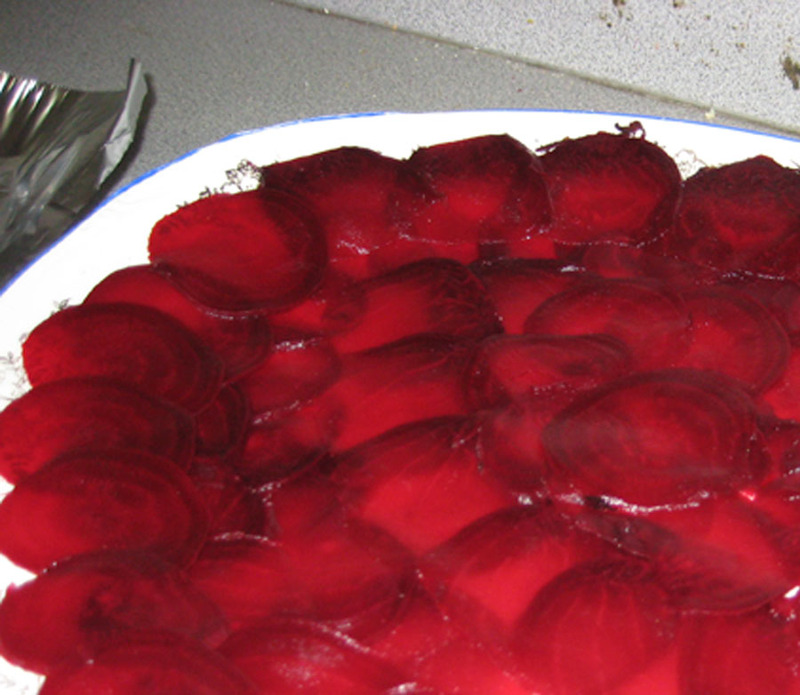 Slice the beets very thin – I did mine 1/16” on a mandoline – and arrange in overlapping concentric circles on a plate. If you’re using a mandoline – and honestly I wouldn’t really want to try this without one– put something underneath it like a piece of tin foil, or saran wrap so that you don’t stain your counters. Staining your fingers is pretty much inevitable (although I suppose you could wear rubber gloves, but this seems like overkill), but beet stains will wash off your skin a lot faster than they will off your counters. Slice the apple very thin (again, a mandoline is great for this), toss with a little lemon juice to stop them from discoloring, and arrange on top of the beets. 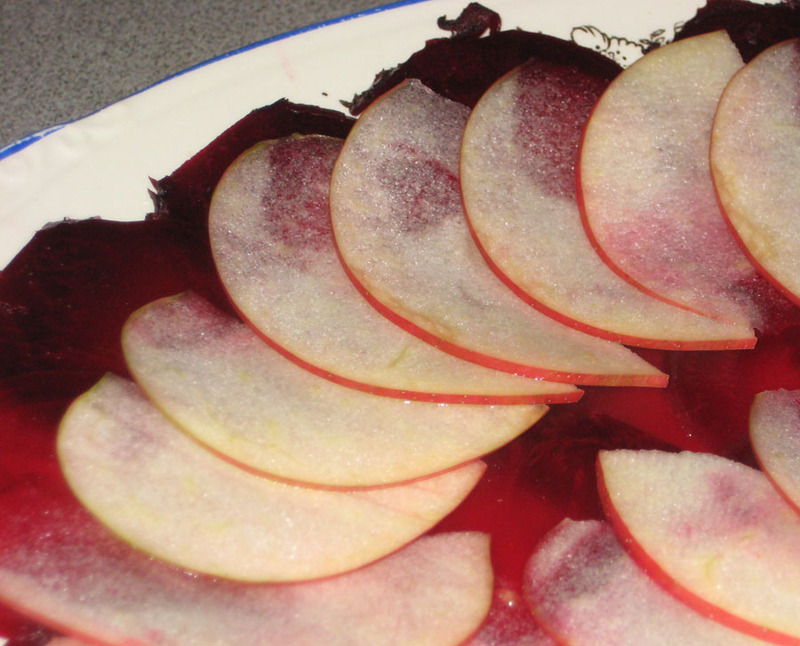 If you slice the apples after the beets they will be tinged slightly pink in interesting patterns, which looks kind of cool. Drizzle some of the dressing over the carpaccio and top with crumbled cheese, mint and chopped pistachios. 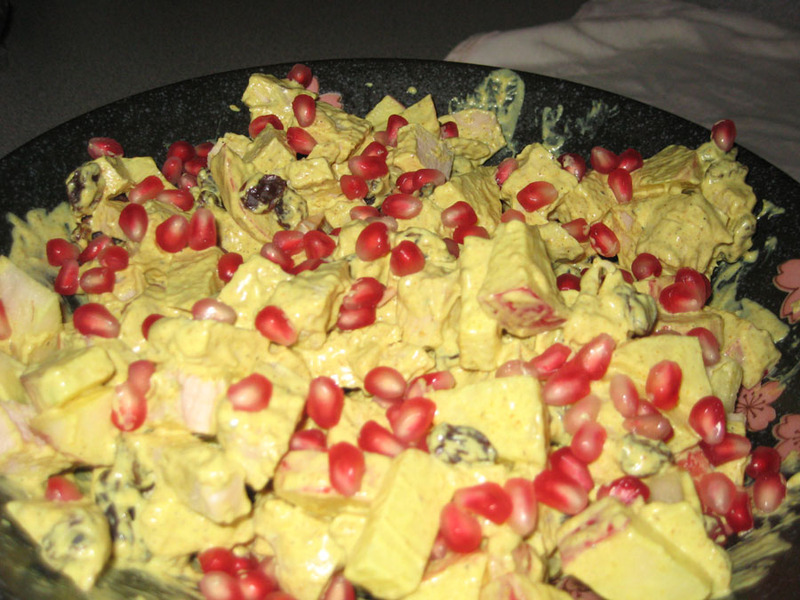 I also added some pomegranate seeds because I happened to have them on hand, but I wouldn’t go wildly out my way to find them. The original recipe calls for you to mound salad on top of the beets/fruit at this point which to me just obscures the pretty patterns you’ve made, so I served the salad separately. The original recipe also calls for grapefruit as well as the apple. I think this is (a) just too many ingredients, and (b) you can’t section the grapefruit as thinly as you do the apple and the beets and it looks odd (or at least I think it looks odd), and (c) I’m the only person in my house who likes grapefruit. * Interesting note about pistachios, they’re not actually a nut, they’re a seed. Obviously if you’re serving someone with a nut allergy you should check with them before feeding them pistachios, but you have decent odds that they’ll be able to eat them. I, too, would like to like beets, but while they’re not bad, I kind of think that they taste like dirt.